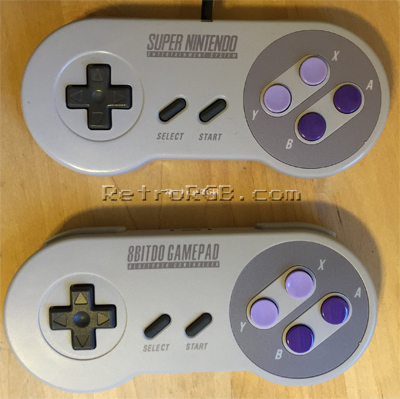 The SNES30 controller by 8BITDO is a versatile controller that works well with many systems, including the Retron 5. It’s functionally the same as the NES30 controller, so this short review will concentrate more on look & feel. For more details on the bluetooth features and compatibility, please check out the NES30 review. The controller is slightly thicker then the original, but it isn’t very noticeable. 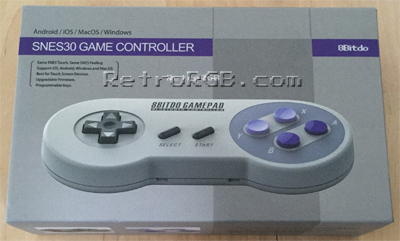 Also, the controller is a bit heavier and I assume it’s due to the battery required in the SNES30 vs. the original. I tested each mode and found that it operated exactly like the NES30 and the only difference was looks. For more details on the testing and functionality please see the NES30 page. Since they perform identically, I felt it best to leave all the feature reviews on the NES30 page, so all updates and features are in the same place. Overall, I highly recommend both controllers and think most people will be pleased with their performance. Please feel free to go back to the main bluetooth controller page, or to the mobile gaming page to see more bluetooth controllers. Also, check out the main page for more retro-awesomeness!